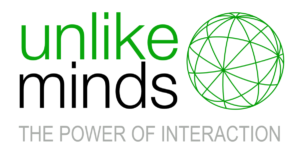 Unlike Minds is a capability network whose associates are at the leading edge of social change thinking. As our name suggests, our strength is in the diversity of the exceptionally experienced professionals each recognised leaders in our respective field. We come together to address complex problems with creative and elegant solutions. to earn sufficient to sustain 1. and 2. Many of our associates have full time roles as general practitioners as chief executives officers and company directors. Their hugely important role is to inform the thinking of those associates with more executive functions. Our current focus is on health and wellbeing information, and on learning, and how they are naturally merged help people make better meaning to inform their thinking and decision making. If it’s of interest, you can find an explanation of the Unlike Minds logo here.